Add two high speed, esd-protected RS232 ports, with 5V or 12V selectable power output through a PCI Express slot. The PEX2S553S 2-Port PCI Express Serial card lets you add twoesd-protected RS232 ports with 5V or 12V selectable power output, through a PCI Express slot. Ideal for industrial environments, this 2-Port Serial card offers built-in 15Kv esd-protection which helps prevent damage to connected devices in the event of line surges and electro-static discharge. An extended operating temperature range (-30 degree to 75 degree) also helps to ensure performance in harsh environments. For devices that require additional power, this Serial controller has a jumper-selectable 5V or 12V power output option (pin 1 and/or pin 9), through an LP4 connection to your power supply. For added flexibility, the power output can be enabled or disabled on a per-port basis so you choose which port(s) supply power. 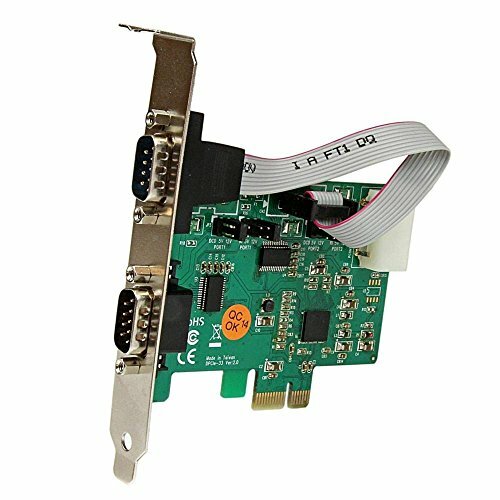 This versatile RS232 card supports high-speed Serial data rates up to 921.6 kbps, and is compliant with PCIe Gen 2.0 specifications for added bandwidth. To maximize installation options, the 2-Port card is equipped with a standard profile bracket and includes an optional low-profile/half-height bracket for installation in small form factor computers.